Baby wearing is awesome and so convenient. Your baby wants to be close to you most (or, all!) of the time, so wearing them will keep them happy. If your little nugget needs to be held or rocked to sleep, a carrier will allow you to be hands-free. 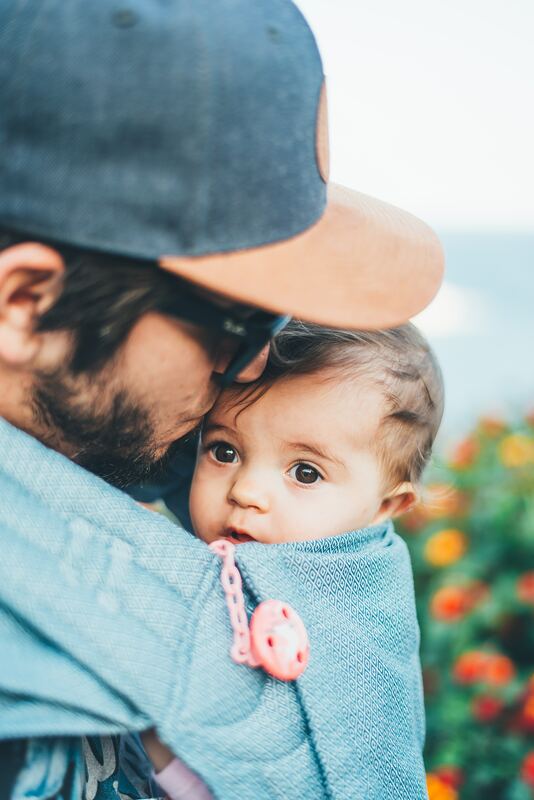 Babies who are colicky or have any reflux issues will benefit from being held upright, and you have the convenience for those times when the stroller or infant seat is too much to carry around with you. There are so many amazing options for wearing your baby, but how do you know which one is the right one? Ergo Baby is the way to go for the most options available. The 360 lets you front carry facing in, out, on your hip or on your back. They have a wide waist band and padded straps so you are comfortable while carrying baby around. ErgoBaby carriers can be used up to 33 lbs. The 360 has also been called a “hip healthy” option by the International Hip Dysplasia Institute. Tula carriers are some of the prettiest carriers. They can be used up to 45lbs in both front and back carry, and are designed for an “ergonomic M-position” for baby. Lillebaby carriers are 4-in-1s that don’t require an insert. They can be adjusted for newborn use easily, have a lot of lumbar padding to support your back, and can carry up to 45lbs. Wraps are wonderful in the early days to keep baby secure and supported, mimicking the feeling of being in the womb. The most important thing to remember with any wrap is to ensure your baby’s airway is not blocked, they are at “kissable” height, and that it’s not too loose. These are great ways to wear your baby if you’ve had a c-section because it keeps pressure off your incision and allows you to be mobile when you’re ready. The JJ Cole Agility carrier is a new one for me, but becoming one of my favourite wraps. It comes in 2 pieces, one that you wear like a shirt that overlaps in the front for when baby is new, and then a second piece that wraps around your waist when baby is ready for upright forward carry. It’s easy to use, comfortable, and takes the guess work out of wrapping yourself. The Moby wrap can seem like a lot to work with, but the more practice you have, the easier it gets. It’s one long piece of fabric that you wrap around your body, and then place baby inside. This one is nice because it’s a one-size fits all, no need for adjustments and you can wrap it as tightly as you need to create a safe, secure place for baby to be. Slings are fun and easy to use, but just like wraps they take practice. Slings are great for nursing and the extra fabric (the tail) makes a discreet cover when you’re out in public. Sakura makes some beautiful wraps, all made in the US. They also have some great videos to show you how easy they can be: http://sakurabloom.com/pages/videos. No matter which option you are considering, ask parents what they used, pop into a retailer near you to try before you buy. What works for some may not work for you, so it’s always best to decide based on your needs and situation. Do you baby wear? Tell us what you used and liked (or didn’t like!) in the comments!